We accept the following credit cards: Visa, MasterCard, Discover, American Express and PayPal. There is no surcharge for using your credit card to make purchases. Please be sure to provide your exact billing address and telephone number (i.e. the address and phone number your credit card bank has on file for you). Incorrect information will cause a delay in processing your order. Your credit card will be billed upon shipment of your order. Dearest Diapers reserves the right to change its policies including prices and promotions whenever deemed necessary without prior notification. Any changes will be posted on our website. At dearestdiapers.com we do allow returns of unused, unwashed, unworn and new with all tags attached (where applicable) items. The return must be initiated within 15 days from the date you received the item. You are responsible for shipping the item(s) back and covering shipping/insurance/tracking. Shipping charges that we covered to get your Order to you can not be refunded! Returns may be subject to a 15% restocking fee that can be waved at our discretion if you chose to receive Store Credit for your returned item(s) instead of a refund. All Sale items, Exclusives, Car Seats, Strollers, Furniture, Monitors, Bassinets and Beds are FINAL sales and not eligible for any returns or exchanges. Please remember, we do not accept returns of Baby Wraps, Carriers or Ring Slings for Woven irregularities such as weaver's knots. *If you received a FREE item or a Promotional Item with your Order (such as Free item on Order over $x), then you are required to return the item unused, unwashed, unworn, when you Order amount falls below the required Purchase amount in Order to qualify for the Free item. Or we will have to charge you for the item, or deduct the Free item from your Dollar Refund Amount. *Dearest Diapers reserves the right to deduct return shipping costs from your refund on returned items! We are more than happy to allow exchanges of unused, unwashed, unworn and new with all tags attached (where applicable) items. Please contact us at info@dearestdiapers.com so we can assist you better with your needs. *We will not refund or pay for shipping to and from you for the Exchange! We want you to be completely satisfied with your purchase. Most Manufacturers handle Warranty issues, so please contact the Manufacturer to find out how to start the Warranty claim. If you need any assistance from us, please email us at info@dearestdiapers.com so we can assist you better with your needs. Shipping Time -- Most orders will ship same day or next business day. Orders are not processed or shipped on Sunday. Most Orders arrive within a few business days. We cannot guarantee when an order will arrive to you. Please purchase Shipping Insurance to cover your precious items. We can not be responsible for packages once they leave here and there is no way for us to ensure the post office handles your items properly. 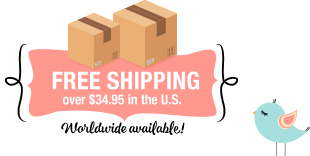 Dearest Diapers uses Real Time Shipping calculations provided by the United States Postal Service in all attempt to find the best shipping quote for you when shipping your Items internationally. Please contact us at info@dearestdiapers.com if you have any questions or concerns. Shipping laws are different in each country. It is your responsibility to check with your Customs office to verify whether the country to which you are shipping permits the shipment of your products. Dearest Diapers is not responsible for any direct, indirect, punitive, or consequential damages that arise from improper international shipping practices.